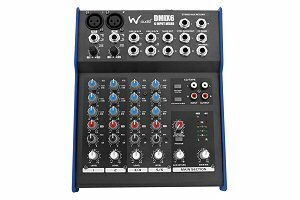 W-Audio 6 Channel Audio Mixer. Ideal for stage, home, project recording or installations, the DMIX series offers a superb natural sound with outstanding parameters at great value for money. The solid design of the DMIX series guarantees optimum performance and a long service life, even when used in a demanding stage environment.